Being aware of the production process helps you understand some of the details on the clay pipe fragments. Therefore the next section will give a brief introduction into the sequence of steps of the clay pipe production process. After the clay is rolled into blanks the piercing rod (iron wire) is inserted into the thin part of the blank which later becomes the pipe stem. The blank is then placed inside the brass mould, the mould is closed and the two parts are firmly pressed together. 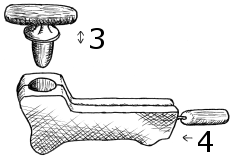 By pressing the iron stopper inside the opening of the mould and tapping it up and down, the bowl is shaped. 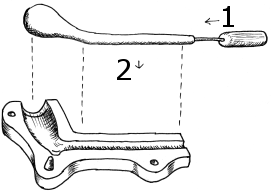 When the stopper is removed, the piercing rod is pushed inward to connect the bowl with the stem hole. Then the mould is opened, the pipe is removed and excess clay (mould lines) is trimmed. The pipe can be finished by rounding off the rim of the bowl and it could also be burnished resulting in a shiny surface. Futher decoration could be milling of the rim and placing a mark on the heel. Finaly the pipe is dried and placed into the oven. Historical pictures from the Dutch national archives 'beeldbank' available at http://beeldbank.nationaalarchief.nl/. There you can view larger versions of the images and even some others, just search for 'gouda' and 'pijpen'. 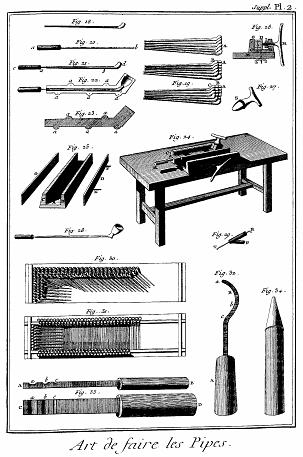 Another interesting source of information about clay pipe production is the encyclopaedia by Diderot and d'Alambert (1751-1772) which is digitised and can be browsed at http://diderot.alembert.free.fr The image below shows equipment used in clay pipe production.